At 19 kilometers northwest of San Jose, Alajuela is the Costa Rica's second largest city, after San Jose. It is the birthplace of national hero Juan Samtamaria and the country's main international airport (SJO)is named after him. 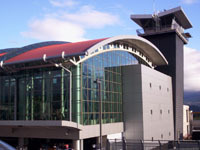 It is Central America's second busiest airport and an important transportation hub for all of Costa Rica. Just a bit warmer than San Jose, Alajuela's climate is tropical with temperatures between 23 - 26 degrees Celsius with a low humidity rate of 20% throughout the year. At an elevation of 952 meters above sea level, it's known for having the "best weather in the world". A great time to visit Alajuela is in April during the Juan Santamaria Day holiday. Enjoy a huge parade and carnival. In July the Mango Festival takes place with concerts, parades, and fairs. The Butterfly Farm and Poas Volcano lie just outside the city are great family excursions.